Capturing weddings at Northbrook Farms is always a delight. 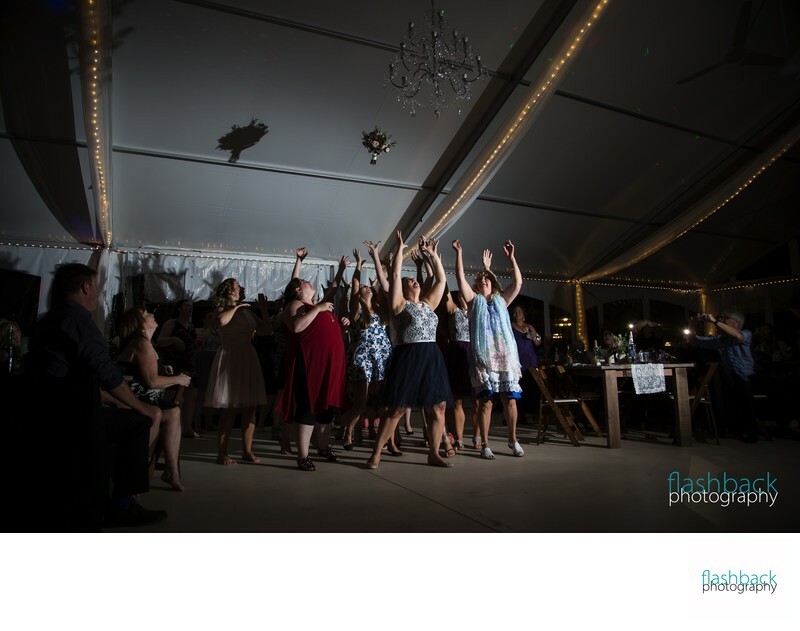 Not only are they located close to my studio in Orillia, but with recent renovations to their permanent outdoor tent they are able to accommodate larger crowds and even more dancing! This group of ladies certainly were happy to show off their best moves as a group, until a fight for the bouquet brought out their competitive sides! I captured this image using a wide-angle lens, to show the entire scene. It is lit using one off-camera flash, to the right of the image. The tent at Northbrook Farm has a white ceiling, and thus the flash light was reflected onto the crowd, so that everyone received some special glow! If you are looking for a unique rustic Orillia garden wedding venue, consider Northbrook Farm for your next event. With an indoor getting ready space, outdoor options for your ceremony, and plenty of accommodation for the party, this is truly a one-stop Simcoe County wedding venue.